Falcon Lodge Estate was almost complete in 1959, when it was described as “a fine model estate comprising of some 1539 houses attractively laid out”. 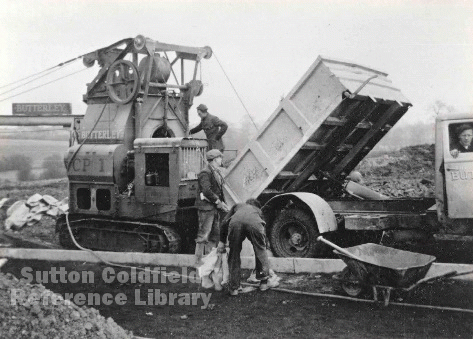 Work had started on the estate eleven years before, after the Ministry of Works had approved the plans of the Borough Surveyor of Sutton Coldfield for the roads and sewers. The 200-acre estate had been purchased by the Borough in 1937 to be developed as a council housing estate, but the outbreak of the Second World War in 1939 made progress impossible. The land was sold to the corporation by Mr. Cattell, a wealthy chemist who lived at Ivy House in High Street, for £37,500; Cattell had purchased it as an investment in 1919, when the existing buildings had been occupied by tenant farmers and their employees. The house called Falcon Lodge, which gave its name to the estate, was demolished to make way for the council houses. Falcon Lodge house is first heard of in a deed of 1824, when it was acquired by William Pepper, a wealthy retired businessman from Nottingham. Pepper retired to a pleasant country house in a select neighbourhood, most if not all of the house being new at the time. It replaced a humble farmhouse, and took the name Falcon Lodge to give it an air of grandeur, possibly built by Pepper himself - the deed describes it as a house with barn, stable, cowhouse, yard, garden and orchard..
Pepper was fifty-one when he lived there in 1824 with his wife Elizabeth, two daughters and a son, and the Peppers were accepted by Sutton polite society. Sarah Holbeche remembered a going to a big wedding there in the 1830s, but by 1861, when Pepper was aged eighty-eight and blind, he had just one unmarried daughter at home and three servants. He died in 1862, and the house was advertised for sale. It was bought by Major Thomas Terry, who owned considerable property in Sutton, including Sarah Holbeche’s house in High Street. He was a native of Sutton, but had been settled for many years in a big house at Walton on Thames with his large family - wife, seven children, governess, butler, footman, coachman, cook and five maids - by 1861. Even with its nine bedrooms Falcon Lodge was too small for his family, so he probably never lived there, and shortly afterwards it was occupied by Francis Parkes, the owner of the spade mill at Powells Pool. Polite Society looked down on the vulgar manufacturing Parkes family in spite of their wealth and prestigious house - Francis added “Farmer of 120 acres” to his description at the 1871 census in the hope of gaining respectability. They had previously lived at the Spade Mill, where Francis’s son James still lived with his family. The house and farm stayed with the Parkes family for over thirty years, leased from Major Terry. 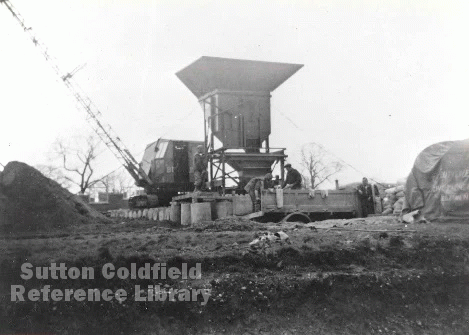 Preparing the ground for Falcon Lodge Estate, c.1950. (photos courtesy of Sutton Reference Library).